If you plan to visit Helsinki as part of a bigger trip to Finland and are looking to ensure you see the best of Finland, then this collection of posts about things to do in Finland should be your starting point. Our first day in the city occurred after we had arrived on the Santa Express Train overnight from Rovaniemi after our visit to Santa in Lapland. We decided to get a taxi from the centre of the city to SeaLife Helsinki, as we were a bit tired from our train journey and it was cold enough. We hadn’t gotten our bearings so thought this was the best option. We got one easily from the central train station and less than 15 minutes later we’d arrived. Whenever we visit a city with our son, we always try to visit an aquarium and/or zoo. It’s something that he enjoys and since we’d visited SeaLife in London with him, we were very happy to learn there was one in Helsinki from the people at My Helsinki. After paying our entrance fee, we got a treasure hunt from the lady on the till and started to make our way through the Helsinki aquarium. There are 50 aquariums of various shapes and sizes to explore with nearly 200 different species including fish, eels and frogs. At different times during the day there are fish feeding and talks and we managed to catch the sturgeon feeding talk. It was conducted in both English and Finnish and our son was quite intrigued. Unfortunately, even though we found a few of the treasure hunt tanks, we couldn’t find anyone to stamp our map. There wasn’t a self-stamp either. So, we ended up ditching the treasure map. Which was a pity as our son had been enjoying it, checking for the right numbered tanks. We spent a lovely couple of hours at SeaLife Helsinki and, although I didn’t think it was as good as other aquariums we’ve been to, it was a good way to spend a couple of our with our son and I even learned some interesting facts about conservation and also the epidemic that is plastic pollution in our seas and oceans. So much so, we’ve started making efforts to become as plastic free at home as we can. SeaLife in Helsinki is open everyday from 10am and can be reached either by taxi, bus or by taking a tram. The Helsinki Card entitles you to a discount to the entrance fee. Normally costing €16.50 for adults and €13.00 for children (age 3 to 14 years), entry is reduced to €9.00 for both adults and children with the Helsinki Card. Enjoying the main tank in SeaLife Helsinki. After we were finished at SeaLife we took another taxi to the Natural History Museum Helsinki which is under the directorship of the Finnish Museum of Natural History. And it is by far one of the best museums in Helsinki. Luonnontieteellinen museo, its name in Finnish, is housed in a building which is over 100 years old and looks very impressive from outside. This is one of the Helsinki museums that is not covered by the Helsinki Card but is one that should not be missed. Entry in 2019 will cost €15 per adult and €7 per child between the ages of 7 and 17. Under 7’s have free entry. A family ticket for 2 adults and 4 children costs just €38. There are four floors in total, with the top fourth floor housing toilets and a balcony. We started with the History of Bones and the first floor and ended our visit with the very impressive History of Life Exhibition on the third floor where we saw some amazing dinosaur skeletons. It was such an amazing Natural History Museum and we were so glad we’d included it in our Helsinki itinerary. 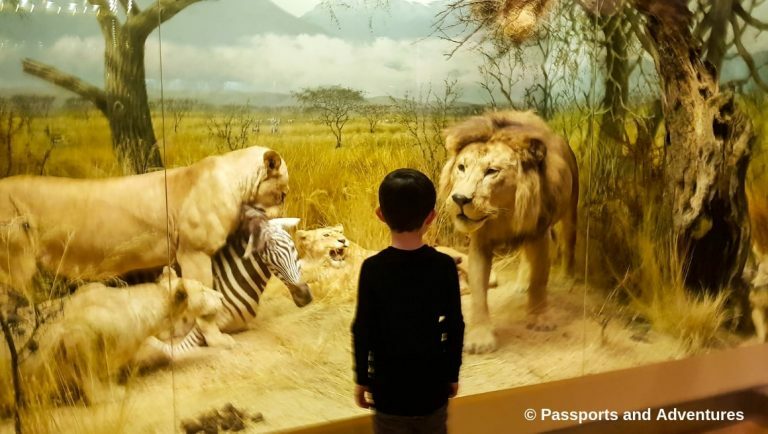 There is so much to explore and discover in the Helsinki Natural History Museum with kids and you’ll easily spend a few hours there. The museum opens either at 9am (winter) or 10am (summer) and it is best to check their opening times and closure days on the website. The museum can be reached by taxi, tram or is within walking distance to the central train station. Admiring an African display in the Natural History Museum, Helsinki. Having visited the London Eye a few times before, when the tourist board suggested a visit to the Helsinki SkyWheel, I knew we’d add it to our itinerary for Helsinki. The Helsinki SkyWheel is one of the best-known landmarks and is located near Market Square, just beside the ferry terminal for visiting the Soumenlinna Sea Fortress. In operation for four years now, it offers some amazing 360° views across the city. Some of the Helsinki main attractions that you can easily spot include the Top of the Rock Cathedral. After paying our entrance fee, we walked up to the barrier and straight on, there was no queue as we had arrived shortly after opening. A staff member helped us on and explained that we could close the window vents if it was too cold. And then we were off. We got four revolutions on the SkyWheel to enjoy the city views. I think we got them as we were the only people on the wheel and it didn’t stop to let anyone else on while we were on it. While it is no London Eye, the views across Helsinki and the harbour are lovely and it’s a great way to get a bird’s eye view of the city. Our son loves these types of wheels and cable cars, and if your kids enjoy them, they’ll love the Helsinki SkyWheel. With our Helsinki Cards we were given a discounted entry fee. It is normally priced at €12 per adult and €9 per child between the ages of 3 and 11 (under 2’s are free). The rate with the Helsinki Card is €10 per adult and €7 per child. The rotation usually lasts for 30 minutes. It is usually open from 11am and operates all year round thanks to its climate-controlled pods, which I will point out are much smaller than those of the London Eye. It can be reached by taxi or by tram, or for those with older children, you can walk to it from the central train station in about 20 minutes. You get an amazing view of the city from the SkyWheel Helsinki. Located at the mouth of Helsinki Harbour, Soumenlinna is a sea fortress and naval base for the archipelago fleet and was built in the 18th century. It once housed over 6000 inhabitants but even today it still has 850 permanent residents. It is a UNESCO World Heritage site and is one of Helsinki’s most popular tourist attractions. To reach Soumenlinna Sea Fortress you need to take a ferry. The Helsinki Card entitles you to free passage to the island. However, we could not figure out how to use our cards to avail of the free passage and ended up paying for our ferry trip. The ferry takes just 15 minutes to reach the island and is also a car ferry. We had just a few hours to enjoy the island, due to a late start to our day, and we only just scratched the surface of the island. 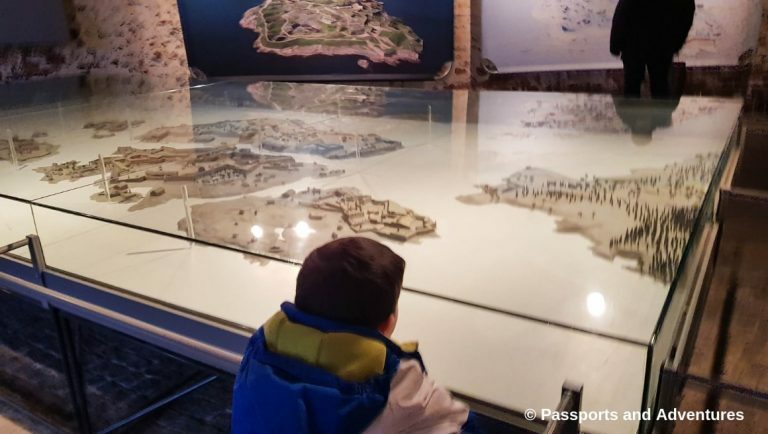 During our time on Soumenlinna we visited the Soumenlinna Museum which tells the history of the naval fortress from the 18th century to present day. It’s a fascinating place and is somewhere you should not miss if you visit the fortress. The Helsinki Card entitles you to free entry whereas it normally costs €8 per adult and €4 per child between the ages of 7 and 16. Under 7’s are free but the man behind the cash desk mistakenly took our four-year-old for a seven-year-old and we ended up paying for him, a mistake I didn’t realise until we’d left the island. So, do watch out. Checking out the model of the Soumenlinna Sea Fortress. Also, on Soumenlinna is the Military Museum which my husband enjoyed while I took our son to the Soumenlinna Toy Museum. We had been warned not to expect much of this, but we loved it. There were toys from all eras, from the 19th century to the 1970’s and I even recognised one or two. The toys on display are a collection from Finland and reflect Finnish games and social history. My son was fascinated by some of the toys and we seriously considered buying a limited-edition Peter Rabbit teddy, which when we compared its price to that of the UK, was considerably cheaper to buy in the toy museum than in the UK. But we’d have never gotten them home. After enjoying the Toy Museum, we stopped for a cake and some warm Gloggi before getting the ferry back to the city. And I can highly recommend the Gloggi in the lovely tea room at the museum. Mr Passports even made it to us for some after the Military Museum. All-in-all, we really enjoyed our visit to the Soumenlinna Sea Fortress and would love to go back and spend a full day on the island. It was so much bigger than we anticipated and there was so much we missed. I think a visit in summertime would be ideal. Entry to the Toy Museum is normally €7 per adult and €3 per child between the ages of 3 and 17. But the Helsinki Card discounts adult tickets to €5. Entry to the Military Museum costs €7 per adult and €4 per child between the ages of 7 and 15. The Helsinki card entitles adults and children to free entry. Soumenlinna Sea Fortress is accessed only by ferry whose terminal is located at Market Square near the SkyWheel. The toys in the Toy Museum on the Soumenlinna Sea Fortress were amazing. The Helsinki children’s museum is called Children’s Town and is located in the Helsinki City Museum near the Rock Church, Temppeliaukio Church. 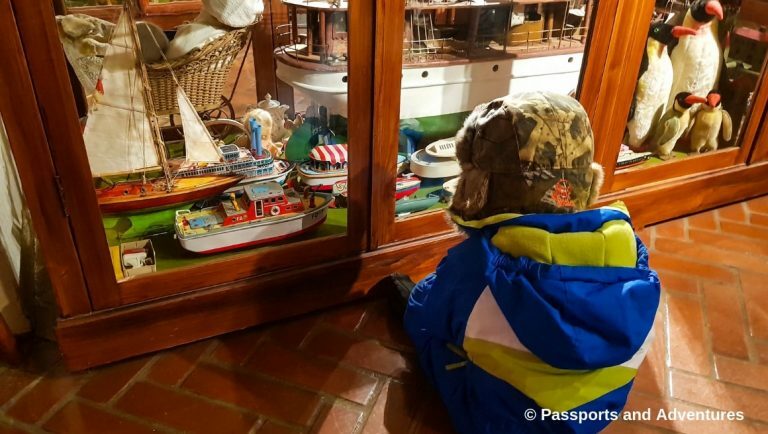 Housed in one of the oldest buildings in Helsinki, dating back to 1757, Children’s Town is a great childrens museum. Opened in May 2016 with the younger generation in mind, this is one of the best free things to do in Helsinki with kids. In Children’s town, both children and adults can learn about the history of Helsinki through play and activities. 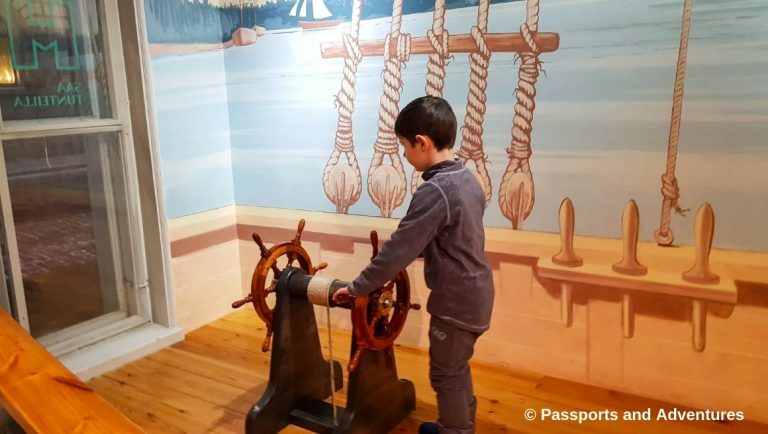 You jump into a horse-draw carriage, sail a ship, work in a cobbler shop, dress up in a variety of outfits and even put on a puppet show as our son did. He had other visitors stopping to listen to his tales as he used a hand puppet. He even got a round of applause from them. There is an 18th century shop for playing shop in, an old classroom with desks that reminded me of primary school and a great display of toys of all shapes and sizes. I even spotted a Cabbage Patch Doll, something I coveted as a child for years. Children’s Town is free to enter and is heaven to children. It was the perfect place for us to end our sightseeing and exploring of Helsinki. Open daily from 11am, Children’s Town is easy to reach via taxi, tram and is also walkable from Helsinki Central Train Station in less than 15 minutes. If you are visiting Helsinki with kids, be sure to stop by Children’s Town. Having fun in Children’s town in the Helsinki City Museum. 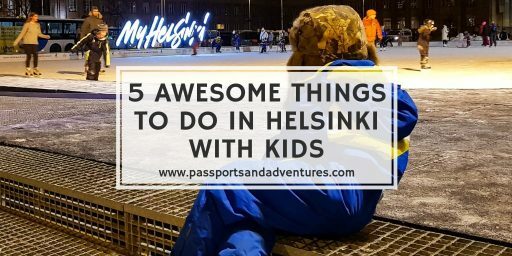 These are some of the top things to do in Helsinki with kids and can easily form an itinerary for two days in Helsinki with children. I would advise that you give yourself plenty of time to spend exploring Suomenlinna Fortress as we only saw a fraction of it during our few hours there. Summertime would be best as the days are quite short in Helsinki in winter and the wind was icy cold during our time on the island. You will also need plenty of time to see all of the exhibitions in the Natural History Museum in Helsinki as the three floors are filled with interesting things as well as some interactive displays. And finally, Children’s Town is a great place to end a day of exploring with kids as they can run free and play to their hearts content. We were kindly given a set of 24-hour Helsinki Cards to explore the city with from My Helsinki. The Helsinki Card offers free or discounted entry to a huge range of the top Helsinki tourist attractions, including those I’ve featured above. You can also avail of free public transport with the Helsinki Card, just note that under 7’s have free public transport anyway. The card will give you free access to many of the sightseeing tours and operators in the city including the Panorama Sightseeing tour bus, the Beautiful Canal Route cruise and the Hop On Hop Off bus. The Helsinki Card is available for 24, 48 or 72 hours for adults and children between the ages of 7 and 16 years of age. Not only does it give you free public transport and free or discounted entry to tourist sites, it also offers discounts in certain food retailers and some discounts with shopping retailers. Check the Helsinki Card Guide book for full details of these. It is really good value for money, and we will definitely be purchasing the Helsinki Cards when we visit the city again. We hope to revisit during summer time, so we can enjoy the city when it’s not so cold. However, there are so many great things to enjoy in the city whether your visit to Helsinki with kids is in June or December. For more information about the Helsinki Card, check out the Stromma Helsinki Card Website. And for information about the city, it’s tourist attractions and more, visit the My Helsinki website. They can also help you plan the perfect itinerary for your time in Helsinki. Whether you have one, two or more days, they can help tailor something to suit your family or party. 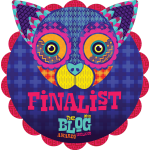 You can even check out other peoples Helsinki lists and recommendations via the My Helsinki website. 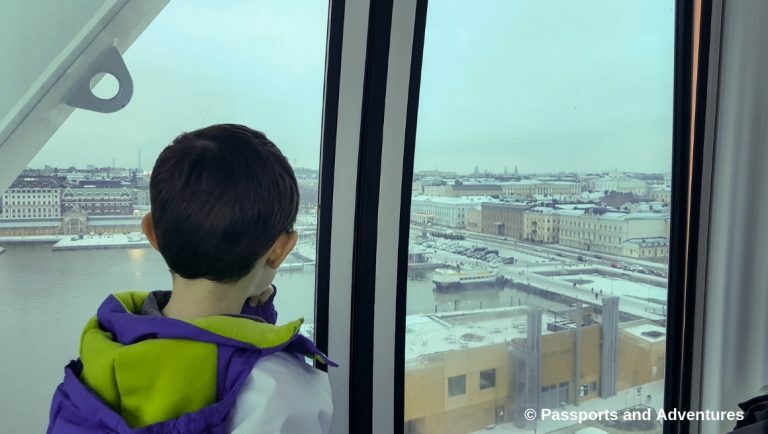 We cannot recommend My Helsinki enough and are very grateful to them for putting together the perfect family itinerary for visiting Helsinki with kids. *My Helsinki kindly helped us create our itinerary for our time in Helsinki. They also kindly gifted us two adult 24-hour Helsinki Cards during our trip to explore the city. We were not asked to write this post. Looks like there is lots to do there for kids. It’s great you could fit in a few days there! Oh wow Helsinki has a lot to offer small families! The sky wheel looks fun! I’ve been to Helsinki … missed ALL of these though (it was in pre-kids days). 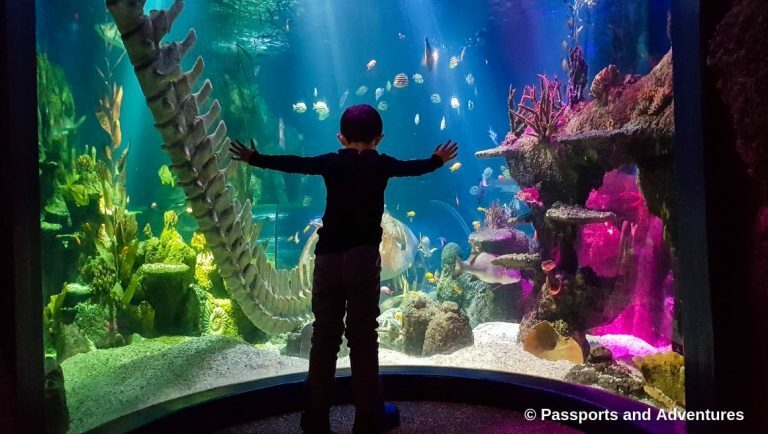 I love exploring cities and what with the mixture of aquarium, museums and the military bit – my lot would love it! I can highly recommend it. We’re eager to return but maybe during summer when it’s warmer! The SeaLife sounds interesting. My kids would love that. We visited Finland for the first time in November too and it really opened my eyes! I would love to explore Helsinki and it’s on our bucket list. It sounds like there is loads to do for kids we also try to get to a zoo and an aquarium too. The cards sound amazing value for money x. Never been to Helsinki, but the Baltic is very high on my list of places to visit in Europe. 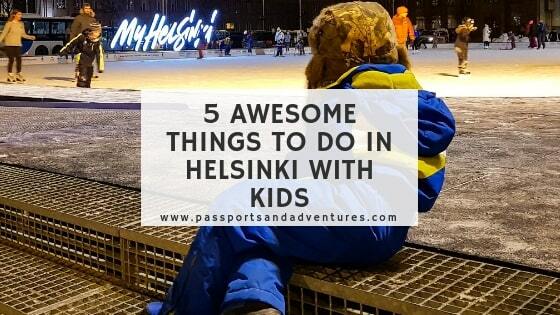 I think my kids would love visiting and the Helsinki card seems like the way to go! I don’t have any kids myself but I do have some younger relatives who love to travel. I’ll have to pass this info along to them. The sea fortress seems especially awesome; thanks for this guide! It must make life so much easier visiting cities and countries when you know there’s so much stuff to keep your kids occupied! Even without kids, looks like such a beautiful city to visit. Helsinki seems awesome for kids. I’ll add in on our list for next year! This seems like a really great round-up of things to do with kids in Helsinki! We haven’t visited Finland yet, but it certainly is up there on our bucket list. It’s so important to find a balance of activities for everyone in the family. If we ever go, we’ll make sure to check these out! Thanks! 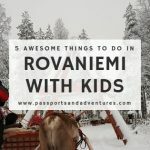 So many great things to do in Helsinki with kids! We went to a few other Scandinavian countries last year, but didn’t make it to Finland. This post definitely makes me want to start planning a trip! I have always wanted to visit Helsinki, although I have to say it looks so cold in these pics but really beautiful. It was freezing, even though we were dressed for it we still felt the cold! What a helpful guide, we didn’t find that much to do in Helsinki (many moons ago now) but so pleased to see there are a load of family-friendly things to do. Since living in Copenhagen for 3 years in the late 2000s, I’ve had a soft spot for Scandinavian countries (although I know that technically, Finland is not Scandinavian!). Helsinki looks really great to explore with kids. My gang would have loved the sea fortress on the island!